DRUG ABUSE ON SCHOOL CAMPUS! Aloha my name is Chalice Hooper-Carvalho and I am a senior at Molokai High School. I am here to put a stop for drug abuse on school campus. Did you know that within the first year our officer has been working on our campus that there were 38 arrests? the second year 32 arrest, the third and fourth years together were 18? Although it seems it has been getting better I am here to help prevent drug abuse and strive to get zero arrests. The consequences of being caught with drugs on campus is not a joke. It starts with an in school investigation by the VP, after the investigation is completed student will be arrested for illegal drugs on campus, attend family court and the judge decides to release you or be sent out to boy/girls home. First degree caught on campus takes action of 45 days suspension, and second degree caught with drugs on campus will be 92 days suspension. Is bringing drugs to school really worth the consequences? If you ask me I would say NO its not worth it. Students think that maybe if they bring drugs to school they are cool but it is only putting themselves in jeopardy. 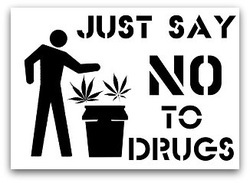 How can you prevent Drug Abuse on school campus? I am here to be a positive role model lets stay DRUG FREE if you have any question you can ask me Mahalo.